GV Health are a leading UK stockist of personal protection equipment suitable for use by individuals in close or frequent contact with infectious outbreaks including Swine Flu, Avian Flu and SARS. Category 3, Types 3, 4, 5 & 6 disposable coverall with integrated head covering (hood) Conforms to UK Department of Health, CDC and WHO guidelines for outbreaks. 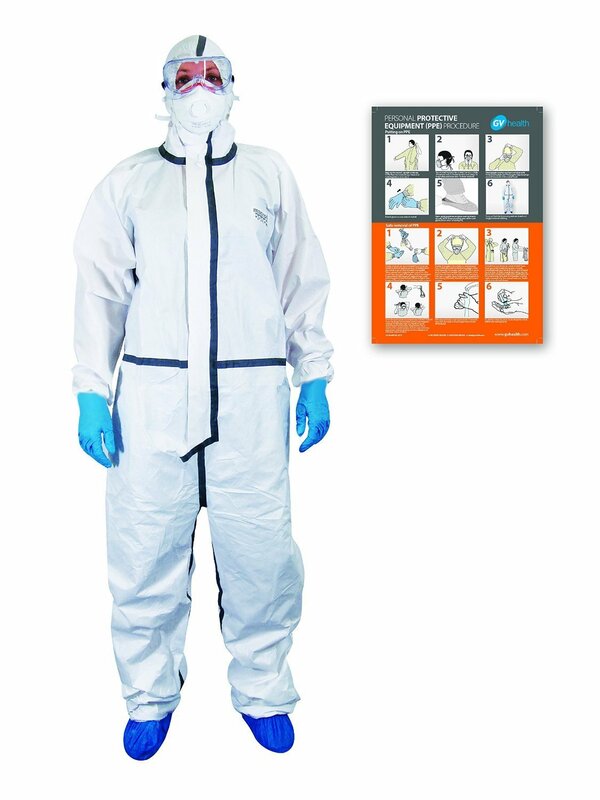 Suitable for first response / rapid reaction teams and clinics and transportation hubs For use in locations with infectious diseases including SARS, Ebola, Swine Flu and Avian Influenza (Bird Flu) Additional PPE packs are available separately. GV Health are a leading supplier of high grade products used for infection prevention and control, emergency response and healthcare waste management. In addition we provide advanced training and cloud based information services in these areas.